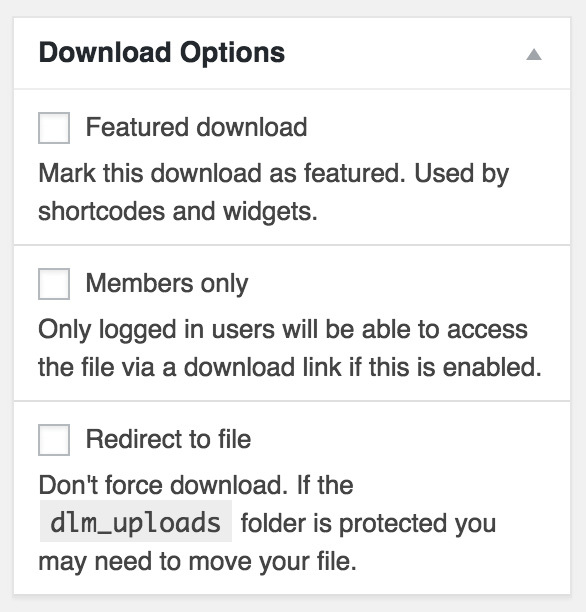 Every download comes with 3 download options out of the box: Featured download, Members only and Redirect to file. Marking a download as Featured download allows you to display the download in special, more prominent, places in widgets and shortcodes. Downloads that are marked Members only will only be downloadable by logged in users. Did you know! With the Advanced Access Manager extension you can make downloads only available to certain roles! By default, downloads are forced to the user. This means the user will be prompted to pick a location for the file on their computer and the file will download to it. When you mark a download Redirect to file, the user will be redirected to the actual file location. This way the browser will decide how to handle the file. Please note that the dlm_uploads folder is protected by default, you may need to move your file when you enable Redirect to file. Did you know! Enabling Redirect to file on PDF files will in most cases allow the user to view the PDF in the browser! Warning Enabling Redirect to file will expose the actual file URL, allowing users to bypass Download Monitor and share the direct file URL.